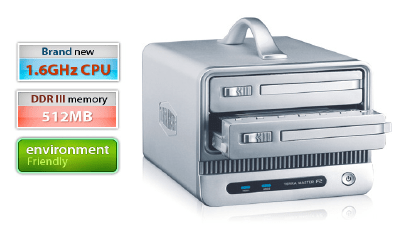 F2-NAS is a new generation network storage device. This device adopts the newest network subsidiary storing techniques, which supports WEBDAV service to let you remote access through network browser or WEBDAB application software installed in mobile devices or upload your photos and other multimedia files to this network device at anytime and anywhere. It supports DHCP, FTP & SMB service, and has sharing management function. It supports BT/PT download function which makes it convenient to download material directly from network, and based on WEB figure user interface, which make it easier for management and convenient for system maintenance. It adopts two 3.5 inch SATA hard drives as data storage, which can support RAI0�?RAID1�?BIG, CLEAR and make it faster and safer. One single hard drive can reach 4TB and it can support 8TB at most. The product has USB 3.0 interface, through this interface you can connect it with PC for data transfer with fast speed.